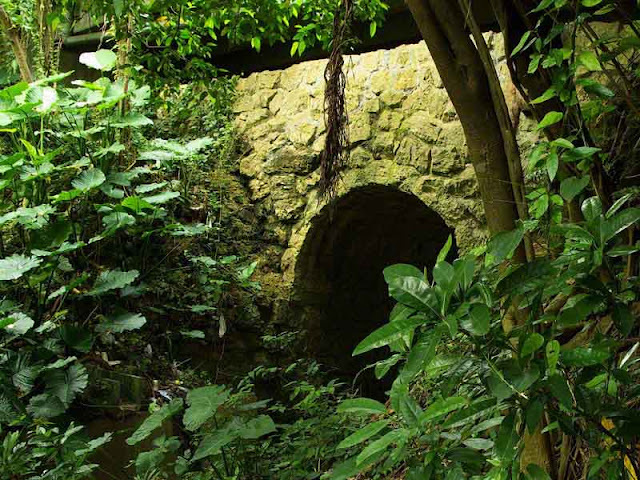 Gara Bridge may be one of the oldest bridges in Okinawa, Japan. It is Uruma City Cultural Asset #17 "Architecture" according to a sign posted nearby. Originally, it was a wooden bridge built for the safety of children going to school. That was back in the days when an Emperor of Japan sat on the throne. Fearing a good downpour could wash the structure away, it was redesigned, as you see it today. Five meters high, five meters long and two meters wide, this bridge was built in 1928. Architects like this stone arch bridge. That's because, they say, the more you use it, the stronger it gets. Note to locals: Map It Okinawa will have to show you how to find this gem. Meanwhile, I'll be bugging Uruma City to see where all the rest of their cultural assets are hidden.